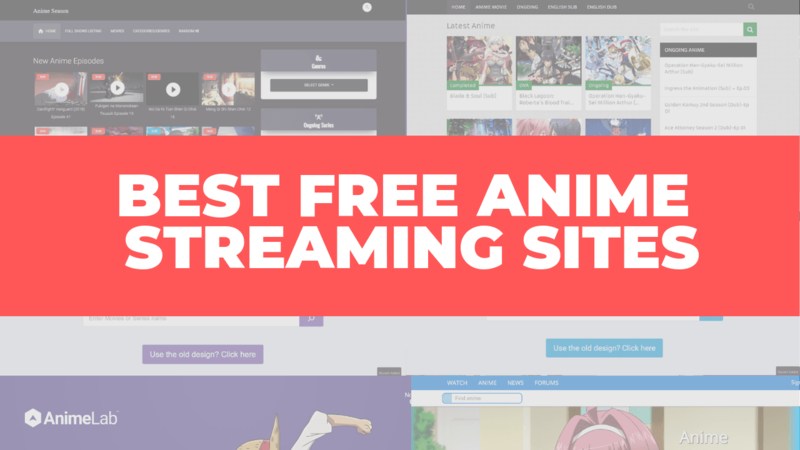 So, which are the best free anime streaming sites? With tens of online streaming sites, it’s rather difficult finding one streaming site with HD quality anime streaming services, but even more complex is that fact that some of these streaming sites might not have all the episodes of the anime you are interested in. Therefore, to help you find all the HD quality episodes of the best anime online, we’ve identified a list of top anime streaming sites you might want to try. KissAnime is renowned and a legendary that’s become the biggest hotspot for downloading the best of anime content. KissAnime has been offering the best quality and free anime content or years and has, as a result, amassed a high number of anime buffs. The popularity of this site stems from the fact that it supports a big variety of video resolution and you can find most multiple episodes on the site. The other reason why anime buffs revel the site is that the site offers both the original and the dubbed versions of anime series. You could also download your favorite episodes, but only after you register your details on the site. The best part of this site is that it’s not just better than normal TV, but it’s also helpful for kids interested in learning a foreign language, Japanese symbols, as well as coding. This is a free global anime streaming site that features subs and dubs. It’s the most common anime streaming sites known for its high loading speeds. The site has one of the best user interfaces, and it also boasts the fastest upload times. This site has one of the best video player quality, and all the alphabets on the site are displayed right on the home screen. You also get to download the episodes. Its drawbacks include the fact that it has multiple popups and ads. Other than these issues, the site offers uncensored streaming. Ani.me is another top site for streaming anime shows, and it only shows the anime sites that have been licensed in the US. You might also like this site because it doesn’t have ads. Streaming on this site gives you high-resolution videos of up to 1080p. If you’re an anime buff, then you might want to try streaming on AnimeFreak, a site that sports an attractively designed and eclectic homepage with bright colors and a Japanese flair. This site boasts the most exclusive of anime content. The site also boasts original and the dubbed versions of your preferred anime series, and over 10,000 other anime series. This database is easily accessible, and anime buffs like the series because the site adds new anime series to the site directly after the release of an episode. To watch your favorite series on this site, you only need to sign up and then start watching your episodes immediately. With multiple categories like the genre and release dates and latest releases, you can easily find the anime you are looking in the shortest time possible. AnimeLab is yet another reliable and renowned online anime streaming site offering thousands of free anime sites. It has a large library of anime shows, but it has one downside, it’s only available to anime fans in New Zealand and Australia, but it’s supported on most of the popular devices like PlayStation, Apple TV, iOS, Android, Xbox, and Chromecast, among others. You might also like AnimeLab because of its unique feature that makes the mouse flip over a series’’ thumbnail when you hover over it, giving you an overview of the show. You will also learn about the number of episodes released for the series, its rating, ads also whether the episode is subbed or dubbed. On the downside, however, the site lacks an age rating meaning that you should consider checking out the available content before you allow your children to stream. The other issue is that the site runs ads and you might have to use an adblocker. Also, its server response is not the best since the company’s refreshes cause downtimes. The video player has basic functions like servers, pause, volume, download, rewind, fullscreen, and speed up functions. Also, the highest available quality of the video is 720p. If you’re looking for a global anime streaming platform that bears a big catalog of animes with subs and dubs, then you should consider trying 9Anime. It comes with preload animes, the website has an intuitive interface, and it also has an autoplay function. 9Anime also comes with HD quality anime series, and you might like the preloads which ensure continuous and uninterrupted streaming. Also on quality is 9Anime’s streaming services and quality of videos that go up to 1080p. Streaming is also uncensored. On the downside, however, this free streaming service cuts its intros and outros, the video player is not the best, and the popups are outrageously annoying. The other probe with this site is that you cannot download your favorite episodes. Animestreams is yet another free anime streaming site that features a big number of anime categories, as well as live anime shows. Being free, the site runs ads, but the good this is that the ads are fewer than the ads seen on other anime streaming sites. It comes with subs and dubs. This site boasts a beautiful and easy to use user-interface, a design feature that makes this one of the best anime streaming sites out there. It’s also free of ads and pop-ups, and it also comes embedded with high-quality video players allowing you to stream anime shows with either captions or animations. While this site lacks a search bar, all the shows come arranged well to ensure that you find the anime show you’re looking for easily. Anime is today, Japan’s hottest and the biggest export worldwide. It’s the newest trend, and somehow, it’s the rave throughout America, North America, as well as European countries. Anime, also called Japanimation originates in Japan, and it represents a handwritten or even a computer-generated comic telecaster across the world. The creatively in the designs and the details of anime make it a big hit in the entertainment world. Like other TV shows online, they are entertaining but being a Japanese comic, it’s scripted in Japanese. With the comics scripted in and running in Japanese, the only way for you to enjoy anime is with the subtitles. And the subtitles are only available online. What this means is that you have to watch Anime from specific sites online in HD quality. Fortunately for you and the rest of the Anime-loving world, you can finally stream Anime from some of the best and most reliable streaming sites online. There are multiple genres of anime shows with Josei and Seinen aimed for persons over the age of 18. And there also are genres for kids. So, no one has an excuse not to watch anime. If you’d like your kids to explore their creativity or find inspiration, then you’ve got to introduce them to anime. Should your kids love anime, they will be able to improve their fanfiction writing skills, as well as their drawing skills. You don’t have to worry about the cancellation of your favorite show. Anime series is ongoing. If you’re looking for something on TV or the internet that leaves you impressed and refreshed, try anime. The production quality of anime features amazing quality characters and animations thanks to the high-quality artwork for the background and the production designs. The background music and the theme songs, regardless of the genre playing guarantee fun. You could also think of Anime as the perfect getaway to Asian music. Most of the anime series streaming sites offer free streaming services which means that you don’t even have to pay a subscription fee for great entertainment. Above are some of the top free anime streaming sites you can use to watch the best of anime series and anime shows, for free. Some of the sites also allow downloading of the episodes. Which are your favorite anime shows? Mine are Monster, Ippo, GTO, Berserk and Hunter x Hunter to name a few.